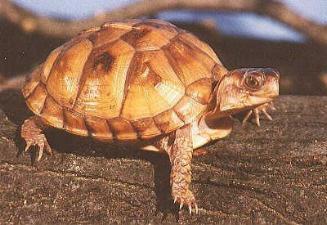 There are a variety of different species of box turtles that come from Asia. Proper care of these animals depends of which species you have. You can find out which type you have at this website, read about its natural history, and learn how to take care of it in captivity. 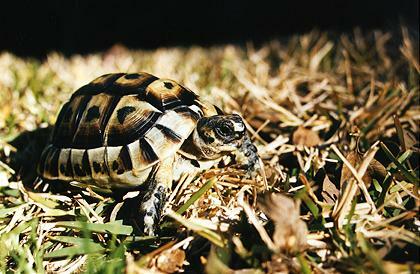 Natural history, captive care and conservation of North American box turtles, Terrapene carolina and Terrapene ornata. Learn how to identify, house, feed, and hibernate box turtles from Tess' on-line care book. 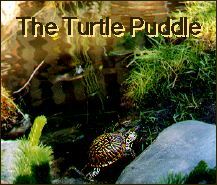 The web page also includes the most extensive list of links on the Web for box turtle web pages and caresheets. different turtles, caresheets and wonderful links! This site keeps interesting records on breeding and longevity of a large variety of reptiles. You can add your reptile collection records to it! 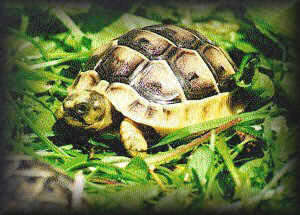 Hatchling Haven is a web site dedicated to Chelonian hatchlings. It contains information on care, diet, habitat, and health. It also has a section entitled "Bits from the Bridge" which features excerpts from "The Bridge" newsletter. Vincent (an ornate box turtle) was moping. So an outdoor enclosure with a pond was built just to cheer him up. During the summer he shares the enclosure with Sien (a female ornate) and Nicky (an old river cooter.) You can see the pond and meet the turtles at this website. This site is owned byReslider Click hereto join the turtle and tortoise webring, dedicated to the quality care and conservation of turtles, tortoises, and sea turtles. The Turtle and Tortoise Webring is an interactive program that will link you to many different pages with information about different types of turtles, tortoises, and sea turtles. Le Village des Tortues and Soptom's goal is to protect french native turtles. They have a wonderul turtle park open to visitors. There you can find different types of turtles as testudo hermanni, emys orbicularis, mauremys leprosa, testudo graeca, testudo marginata, testudo horsfieldii, testudo kleinmanni, andGeochelone sulcata. They have a catalogue on-line, but you can also order by mail a more complete catalogue which includes wonderful encyclopedias and books about turtles, most of them writen by the experts of SOPTOM. Also in English version. Information about taxonomy, dimorphisme, habitat, nutrition, etc of various turtles. Turtles from Nova Scotia (painted, box, etc..). Nice pictures and observation instructions from the Museum of Natural History of Nova Scotia, Canada. This is an excellent site with all you need to know to care for terrestrial turtles, specially native turtles from Spain (testudo graeca and testudo hermanni). It has a wonderul gallery of pictures! This link will take you directly to the turtles menu of the Zooloco site. Here you will find mostly turtle pictures, but they are worth to see! There are pictures of galapagos, land , aquatic and sea turtles.